I don’t think I’ve ever written a post on this blog that directly promoted specific products, but my attendance at BlogHer Food ’10 a couple months ago in San Francisco netted me a couple opportunities from Kikkoman and Sous Vide Supreme that I couldn’t really pass up. Writing about Kikkoman products wasn’t a problem for me because I was raised on Kikkoman soy sauce, and it’s also the only shoyu my wife allows in the house. Longtime readers of this blog know that I’ve been sous vide cooking for a few years now and that I’ve had issues with the immersion circulators I’ve owned. I’ve been in the market for a replacement since my latest stopped circulating and the Sous Vide Supreme is an option I’ve been considering. 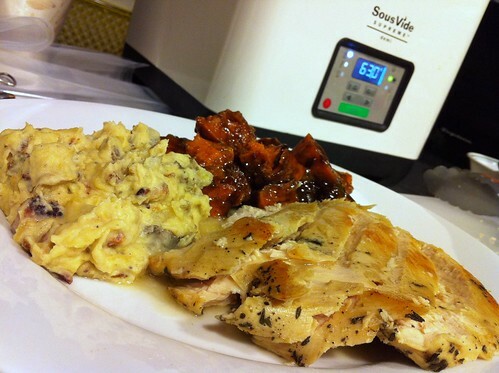 I recently received a demo unit of their new Sous Vide Supreme Demi and decided to sous vide some turkey that was brined using Kikkoman’s soy-sauce-based recipe. Instead of buying a whole bird, mainly because I didn’t want to break it down into parts, I bought separate turkey pieces: two each of legs, thighs and breasts. I deboned the thighs and breasts and removed the skins so I could make turkey chicharrones. That’s right…turkey chicharrones. If you’re curious, I basically followed the same method I used in my fried pork rinds post to make the turkey chicharrones. 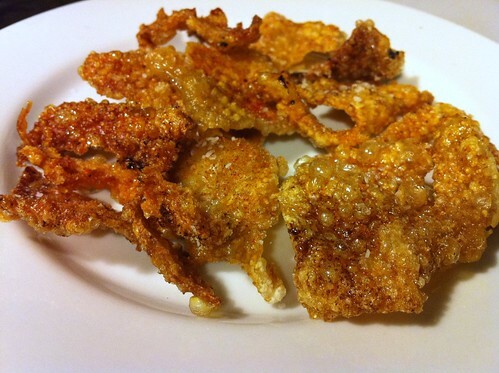 They’re not as crispy and delicate as pork chicharrones, but they’re still tasty. After brining the turkey overnight, I turned on the Demi and set the temperature to 65C. As the Demi was heating up, I rinsed the turkey pieces and then bagged and sealed them using the Sous Vide Supreme vacuum sealer. Since dark meat takes significantly longer to cook than white meat, I put the legs and thighs in the Demi at around 9am and went to work. At around 5pm, I called my wife and asked her to take out the legs and put them in an ice bath to stop the cooking process and quickly bring them to a safe temperature. 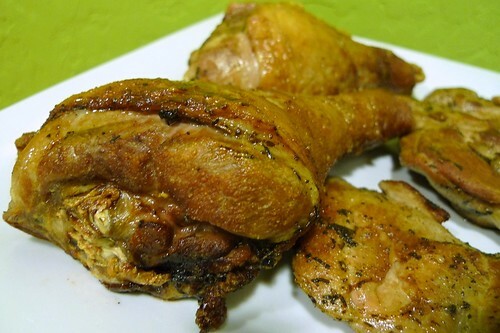 The legs were replaced in the Demi by the breast meat. Dinner was at 8:30, so this was plenty of time to cook the breast meat. When I was ready to get dinner plated, I filled a cast iron skillet with enough oil to fry the turkey legs (about halfway up the side) and heated it to 350F. While the oil was heating up, I removed the thighs from the Demi and finished them by searing them a separate pan with a little bit of oil for a couple minutes on each side until the turkey was nicely browned. When the frying oil for the turkey legs reached 350F, I fried the legs for about five minutes—turning them as necessary so they didn’t burn—until the skin was brown and crispy. The legs and thighs were more than enough to feed the five of us, so I didn’t bother finishing the breast meat and saved it for later. While the turkey legs were frying, I assembled the gravy heating up the bag juices in a small pot then mixing in a little butter and flour until it thickened. in the Sous Vide Supreme Demi. The finished turkey was juicy and the flavors were well balanced. The soy sauce didn’t overwhelm the turkey but merely enhanced all the other flavors around it, and it helped give the turkey a nice brown color. I think the goal of Kikkoman’s marketing campaigns the last couple years is to show that soy sauce can break out of its Asian sweet spot and be used to enhance the flavors of any genre of food, and this turkey brine is proof of that. Kikkoman Turkey Brine is very delicious. Thank you. Can we try this replacing turkey with beef or pork?